It was cold in Montreal, and even though it was spring, the light chill of the air relentlessly chanted winter’s icy echo. At least I had chosen a hotel room with a kitchen. Cooking for oneself while traveling not only makes a space warm, it saves money–and that is exactly what I needed. My time in Montreal was continually being extended, and with it, the cost. Endless meetings always seemed to end with scheduling a new meeting. But over all, my life as an indie film producer was showing a slight forbearance of success. My film was getting packaged. A casting director had been chosen, locations set; a director courted. I had worked hard for this moment–and maybe just maybe–the film I had nursed for the past three years would finally sprout wings. Did I mention I was also desperate? Over the preceding three years, I had also invested thousands upon thousands into the film–because some very smart, successful, business men had told me that to succeed in business–even the film business–I must dare to climb up a financial rope and cut the length off below me as I climbed. I had naively taken the dare, sinking the proceeds of my house into celluloid potential. But I knew. I knew if this didn’t work out, I would be broke. The phone rang. Was it the phone? I was not used to the sound of the hotel phone ringing. I ran to the sitting room to answer it, and glanced at the clock. It was 8:00 a.m. A pleasant sounding woman from the film company announced to me in a birdlike voice that she was sorry to disturb me so early in the morning, but she had been instructed to call me right away. During their monthly company meeting the night before, the president had decided to scrap all film projects and solely invest in television. They would no longer be working with me on my project, and were calling off any further development. Out of shock, my response was almost amiable uttering “thank-yous” and “I understands.” With a relieved lilt in her voice, she wished me well–as if I was a customer leaving a candy store. I hung up, and stared at my bare feet jutting out from my pajama bottoms. The verdict had arrived. My project was officially dead, and my thoughts swam. Who else could I call in Montreal? Was there another company I could pitch to? “Take a bath.” The words came out of my mouth before I had the idea to say them. “Take a bath.” The words came out of my mouth before I had the idea to say them. Was that me? Did I say that? For some reason I didn’t question it, and walked straight into the bathroom and ran the water. I stayed in that pale ceramic tub for over two hours. My body began to resemble a cream-colored dried apricot, and my face was swollen. I only cried the first hour. The second hour, I met some sort of numb acceptance. Every once in a while I would drain out some of the cold water, and refill it back with hot. I was determined to not leave that tub until I had some clarity, and after what seemed like eons, acceptance turned into a knowing–a knowing of only the next few steps. I would head home on the first plane the next morning, and march straight to my office. Then, I would commence the closing of my company. When the water gurgled down into the drain, I was glad to see my former path go with it. I would find a new life. There have been other transitional or ceremonial baths in my life, and most were instrumental in washing away life’s pain–physical or otherwise. However last year, I drew a special bath, and bathed for readiness. Two weeks before my City Hall wedding in NYC–before I knew that the word “busy” would be a ridiculous word to describe the weeks surrounding my wedding–I drew myself a bath. I placed within it, salts and herbs that for me, represented love. I prayed in that bath. I prayed to ready myself for a life of loving commitment. I also made the conscious choice to allow happiness in my life. I watched the lavender buds swimming around in the water, dancing with the rosebuds. “I choose happiness,” I said. “I choose commitment. I choose… love.” I rose with solemnity, but also joy. We cannot escape the transitory nature of water. If I think about it, maybe I was taught this lesson way before I realized there was even a lesson to be learned. 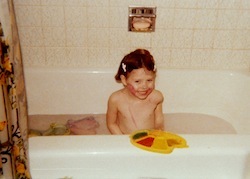 When I was a child, my Grandmother would pin my hair up into curls and draw me a bath. She placed in some toys, my “soap paint,” a wash cloth, and left me to myself. I know she kept an ear on me, but I was allowed to have “me time.” I know now by her actions that she was teaching me how to take stock of my day and prepare for tomorrow–all with a lovely pause in between called a bath. Mix all ingredients into a bowl, adding the oils last. Place mixture into three pint sized mason jars, and give them a label. Keep one for yourself. Give the others away as gifts. 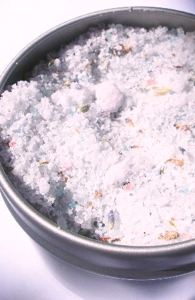 For a variation: In a small bowl, mix 1/2 cup of this bath salt mixture with 1/2 cup of olive oil. Bring it to the bath as a scrub. Enjoy.